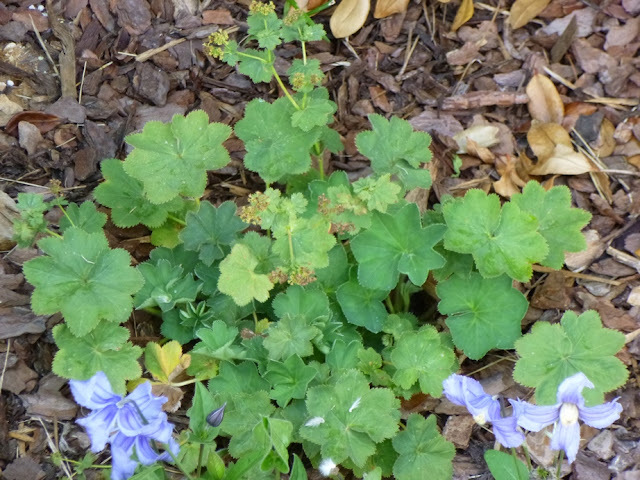 Alchemilla mollis, Lady's Mantle in early July. (The blue flowers are from an adjacent bush-type clematis. Lady's Mantle does have flowers with a long bloom season, but its flowers are the tiny yellow specks that you can see in the middle and upper sections of this photo. 2. The plant's unique ability to catch and collect raindrops and dew. The water caught on the plant's leaves was once thought to possess magical properties. 5. According to some sources, young leaves may be edible raw; root may be edible cooked. Have not tried this so I cannot provide any first-hand opinion on this. So far, I'm really fond of this plant. I'm kind of hoping it will invade a little (but not too much).